Recent posts on The Strategist have looked at Indonesia’s future strategic choices between the US (and its allies) and China. Daniel Grant presents an interesting view that Jakarta won’t easily side with Washington, even in the face of China’s hegemonic expansion. As he sees it, Jakarta’s bebas aktif foreign policy and ‘non-alignment’ militate against choosing sides in major power competition. I agree that Jakarta is playing it safe, keeping the United States engaged while simultaneously cultivating ties with China (and with other emerging powers, such as India and Japan). During the Cold War, Indonesia used its bebas aktif foreign policy successfully when it avoided strategic alignment with the competing superpower blocs (despite Jakarta’s pro-Western foreign policy under President Suharto). However there are those who assume that in the context of Sino-US strategic relations (or competition), bebas aktif can once again save Indonesia from declaring its strategic alignment. I think this is a dangerous assumption. Indonesia, and in fact the rest of Southeast Asia, currently can’t be sure whether China is still content with the status quo, or is already bent towards hegemonic expansion. And Indonesia’s hedging strategy is, by and large, a manifestation of this uncertainty. But hedging carries mixed policy messages. In a way, it could be understood as an anticipation of future uncertainties—a backup plan for when things get tough. In a sense, this is what Australia currently does: it cultivates and enjoys close economic ties with Beijing, while strengthening its military partnership with the US and its allies. Alternatively, hedging could also mean a ‘wait-and-see’ approach (not knowing what to do) until one gets a clearer picture of the strategic environment, or specifically, China’s future behaviours. Hedging is pursued not to anticipate undesired future possibilities (including worst-case scenarios) but to avoid and defer difficult strategic choices. Unfortunately, this is precisely what Indonesia is doing now. Waiting to get a clearer picture of how the future balance of power will play out between China and the US is like drifting towards a fork in a river, with one leading to a waterfall. The longer the waiting game, the greater the strategic risk becomes and the less time available to pursue one of your options. In other words, we might hope for a peaceful international order with China’s rise accommodated peacefully by the US. But if push comes to shove (i.e. when China isn’t satisfied with the status quo), there might not be much stopping us drifting towards the edge. So it’s critical to steer away from that outcome early on. Until such a moment arrives, however, Indonesia is blissfully enjoying the benefits accrued from hedging. After all, why should it focus on the long-term viability of hedging if it can enjoy the short-term benefits? By hedging between the US and China (PDF), Indonesia is likely to get the most from both. Close interdependence with China is new for Indonesia, as it is for Australia. When Jakarta normalised bilateral relations with Beijing in 1990, little did it know China would become one of its most important economic and, increasingly, defence partners fifteen years later. China become Indonesia’s second biggest trade partner and it also offers an alternative to Jakarta’s western partners in defence cooperation. Despite its many shortcomings (PDF), Beijing’s military technological assistance comes with no strings attached. This allays Jakarta’s concerns over a human rights record of concern and potential arms embargoes imposed by the West. But there are limits to this approach. While Indonesia remains faithfully engaged in diplomacy via regional architecture, the outcomes might not be to Jakarta’s expectations. For example, conflict between China and American allies in the South China Sea or competition over control of maritime choke-points could potentially turn Indonesia’s surf into a maritime battleground—a geostrategic curse for being located at the Indo-Pacific crossroads. In that case non-alignment is the worst of all possible options. Indonesia is undoubtedly caught in what Franklin Weinstein calls ‘the dilemma of dependence’. Although coined decades ago, the term is still relevant today. 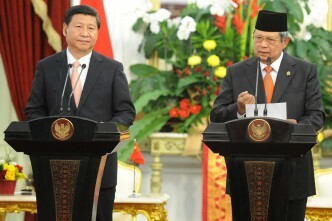 Jakarta doesn’t want to be perceived as being too closely aligned with either China or the US. But there are signs that Jakarta’s non-alignment is being tested to the limit. It has begun pondering the ‘limits of independence’—and at some point, it mustchoose a side. It may not necessarily be the US. In a democratic Indonesia, public opinion is central in foreign policymaking processes. But Indonesian public’s opinion toward Washington (PDF) is mostly ad hoc and reactionary, rather than permanent. For example, while Indonesians generally disliked George W. Bush, Barack Obama’s administration is warmly welcomed. This is facilitated by the democratic values that the US upholds and Indonesia shares, which allow administrations to change from one extreme to another (for better or worse). In contrast, it’s unlikely that a leadership change in China could bring about a similar change of mood in Indonesia. Considering these limits of independence, I can understand why Indonesia will likely side with the US, and I’m not surprised that some Indonesian officials have echoed this statement. 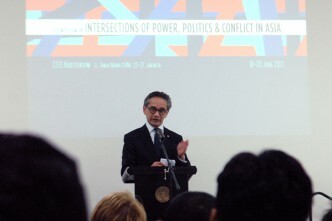 In his speech (PDF) before a Washington audience last May, Indonesia’s Foreign Minister Marty Natalegawa acknowledged the deteriorating strategic environment, fuelled by trust deficit and territorial disputes, which led him to propose the ‘Indo-Pacific Treaty of Friendship and Cooperation.’ People may interpret this as one of many Indonesia’s initiatives to maintain a stable regional order. I beg to differ. I perceive it as a sign of frustration: Indonesia is beginning to realise that its strategic environment is getting more dangerous. And when looking at its strategic choices: it must decide sooner rather than later. Ristian Atriandi Supriyanto is an associate research fellow with the S. Rajaratnam School of International Studies at the Nanyang Technological University in Singapore. 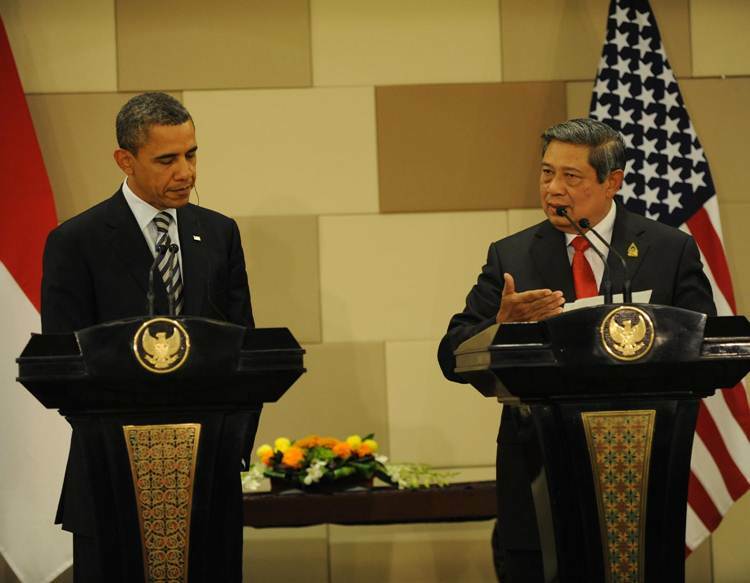 Has Indonesia welcomed the US pivot?